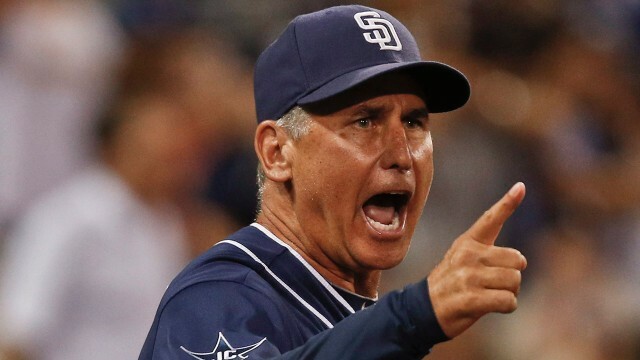 The San Diego Padres this week fired long-time manager Bud Black. The team was hovering around the .500 mark and with several free agent moves this past season, the team was hoping for a better run at the top spot in the National League West in 2015. Black compiled a 649-713 (.477) record in eight-plus seasons with the Padres. He was the 2010 N.L. Manager of the Year when the team was 92-70 and finished two games out of first and one game short of winning the league wild card that season. He had two seasons over .500 and no post-season appearances during his tenure. Black’s Padres never won a division title during his eight full seasons. That’s the ultimate answer to the statement made in the title of this blog. Black’s 1,362 games with the Padres are the most games managed by a National League manager who never saw his team finish in first place. Fortunately for Black, he does not hold the MLB record; Chicago White Sox manager Jimmy Dykes, who skippered the White Sox from 1934-46, managed the White Sox for 1,850 games and never saw Chicago’s Southsiders ever finish in first place during that time. Here’s a look at the 19 managers who managed a team for 1,000 or more games yet never saw the team finish in first place. Note: Two managers appeared twice on the above list, Gene Mauch and Bobby Valentine.